I’ve said it before and I’ll say it again: I’m a neat freak. Being in a clean place makes me happier and more comfortable. What’s wrong with that? Well, I’m sure a few weeks or even months, a comfortable chair, and a highly trained therapist could help me understand why I ‘need’ things to be clean. Well, I don’t need things to be clean, but I certainly do prefer it. And for that reason, I’m glad we have a cleaning lady. Our cleaning lady, E, comes every two weeks. Based on what I said above, you can guess our house is not especially messy, as we (Mrs. MMK also prefers a clean house) keep it up. So, you would think it be simple when E comes. She would take a relatively clean house (it’s only relatively clean because of the kids. Yup, I’m blaming them) and get to those harder to reach places, etc. and make it even cleaner. One of the great things about blogging is meeting people – electronically that is – from all around the world. Imagine my surprise when I realized a fellow blogger who I’ve been following for over a year now is practically my neighbor. Yes Jackie of Ambling and Rambling is a fellow Bergen County resident. My neighbor and fellow blogger. She has been married to Fang (an homage to the late, great Phyllis Diller) for almost 25 years. They have a teenage daughter, “Fangette”, for whom she has little patience, but great love. What parent of an adolescent can’t say the same? Jackie has been in the service industry for thirty-two years. She has worked in all types of establishments. These days she is at a steak house where she splits her time between serving and bartending. Ambling and Rambling focuses on the trials and tribulations of being in a long-term relationship, raising a teenager, and working in the service industry. Her perspective is often funny and insightful. 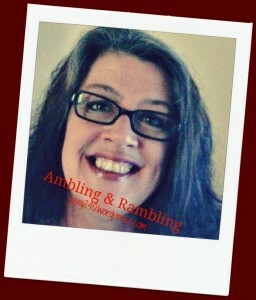 Make sure to check out Ambling and Rambling. I’m sick of all the extra work snow involves. I’m of the opinion that something as simple as retrieving the mail shouldn’t require crampons — not in the wilds of suburban New Jersey, anyway. Don’t even get me started on the shoveling. Or the ice-covered everything. Winter wonderland, my patootie! In fact, I’ve grown so proficient at it that I’ve been giving some real consideration to petitioning for its inclusion in the next Olympic Winter Games. I’ll have to come up with rules, a scoring system, and money for bribes of course. However, the work involved and the financial considerations will be small prices to pay for indulging my gold medal dreams. Sure, rock salt would eliminate the need for hanging ten on the driveway, and rumors of its existence abound. For something that in any other year has always been an abundant and readily available substance, procuring such has proven as elusive here in 2014 as finding a Cabbage Patch doll was in 1983. When driveway surfing becomes, as I suspect it will, all the rage, I will undoubtedly be grateful that the shortage of this product made it all possible. Invention being the mother of necessity and all that. Working has been a challenge, as well — and an unprofitable one at that. Members of the general public, not to mention the majority of my co-workers, do not seem to share my level of commitment for getting to the restaurant. As if going to work and coming away without any financial remuneration isn’t, in and of itself, enough to make anyone a mite cranky, the expectation that while I’m there — because I’m there — I will do cleaning projects is enough to send me round the proverbial bend. I’d rather pick nits out of ferrets. Ferret grooming aside, there is very little that I enjoy participating in less — even in my own home — than cleaning. I clean the hovel because I have to. Unlike my bosses at work, I don’t have any members of the slave labor force hanging about that I can press into service. My teenager, not surprisingly, has better things to do. It’s all I can do to keep this immature and unseemly behavior contained in fantasy world. I’m convinced that the sole reason I’m able to keep it from spilling forth into the real world is how embarrassed I would feel after such a meltdown. It’s really no way for a future gold medalist to conduct herself. I’ve discovered a way out, though. For years I’ve observed others successfully employ this method. I’ve always subscribed to the theory that “A job worth doing is worth doing well.” So, I could never bring myself to participate in the kind of subterfuge that I am now wholeheartedly embracing. Unlike the positive attitude I’ve adopted where driveway surfing is concerned, I’m doing the bare minimum in the area of workplace cleaning. And, I’m doing it well. I’m happy to report that I’ve calculated my laziness score to be 8 out of a possible 10. I think that’s pretty good for a novice!